The issue of corruption within FIFA has become a hot topic in recent months, following the Sunday Times sting operation that caught out two members of the executive committee and the Panorama programme by Andrew Jennings that accused a further three members of accepting bribes from ISL back in the nineties. Sepp Blatter and FIFA have resisted calls for a thorough investigation for years, but the pressure on them is becoming almost too much to resist. The FIFA executive committee is the main decision-making of the organisation and, amongst other things, is responsible for deciding the hosts of the World Cup. It consists of the President of FIFA, eight vice-presidents and a further fifteen members, appointed by the various confederations and associations. Sepp Blatter is the President of FIFA, and has been since 1998 when he succeeded former President and mentor, Joao Havelange, who was named honorary life President. The vice-presidents include senior vice-president, Julio Grondona, who is head of the Argentine Football Federation, the head of the Confederation of African Football (CAF), Issa Hayatou, Jack Warner, the President of the Confederation of North, Central American and Caribbean Association Football (CONCACAF) and Reynaud Temarii, the President of the Oceania Football Confederation amongst others. Amongst the other members of the committee, we find the likes of Ricardo Teixeira, the President of the Brazilian Football Confederation, Nicolas Leoz, the President of the South American Football Federation (CONMEBOL), Mohamed Bin Hammam, the President of the Asian Football Confederation and Nigerian Amos Adamu. There are a number of other characters from outside of the executive committee that play a part in the story. We have former head of marketing at FIFA and current General Secretary, Jerome Valcke. Captain Horace Burrell, the President of the Jamaican Football Association, and Chet Greene, the former General Secretary of the Antigua and Barbuda Football Association are two more individuals that will play a prominent part. One final character that will appear on several occasions in a slightly different role is Jean-Marie Kyss, the head of the Haitian Football Association. The most recent scandal was that involving the Sunday Times investigation. Undercover reporters recorded footage of senior FIFA members seemingly accepting money in exchange for their vote in the bidding for the World Cup. Vice-president, Reynaud Temarii, and executive committee member, Amos Adamu, were both subsequently investigated by FIFA’s ethics committee. Adamu was fined £6,341 and suspended from all football activities for three years, while Reynaud Temarii was fined £3,170 and suspended for one year for their parts in the scandal. Four other former members of the executive committee was also indicted in the investigation. Botswana’s Ismael Bhamjee was banned from football for four years, Mali’s Amadou Diakite and Tonga’s Ahongalu Fusimalohi were banned for three years and Tunisia’s Slim Aloulou was banned for two years. For virtually the first time, allegations of corruption had been investigated properly and punishments handed out. The public pressure from the allegations had been too great for FIFA to resist. However, this is by no means the first time that supposed incidents of corruption have taken place within the hallowed halls of FIFA. The first short story we shall look at involves a predominantly Caribbean cast. In July 1996, FIFA were meeting in Zurich for their bi-annual conference with a particularly important item on the agenda – a proposal to increase the size of the executive committee. Jack Warner was hoping to push through the reform as he hoped it would give him and his allies greater power and seats on the committee. Dr Jean-Marie Kyss was the head of the Haitian Football Association. His invitation to the event was delayed in the post and his federation was short of funds, so he informed CONCACAF that he would not be attending the conference. FIFA’s head of credentials then received a call informing them that Dr Kyss had dropped out a while ago and that Haiti had sent a replacement by the name of Vincy Jalal. The new Haitian delegate took their seat next to Grenada’s representative, Colin Klass, and near to Jamaica’s Horace Burrell. This all seems relatively straight-forward. Until we look a little more closely as to the identity of Haiti’s new delegate. Vincy Jalal was actually the wife of Captain Horace Burrell. Despite being surrounded by CONCACAF delegates who must have known the identity of Dr Kyss and some of whom who must have known Ms Jalal, no objections were raised by Jack Warner’s loyal representatives. When the roll call was carried out, Ms Jalal used the only word she knew in French, the language of Haiti, to respond – ‘Oui.’ Fortunately for her, she did not need anything further. She submitted her vote under Haiti’s name as she was instructed to by her husband, Burrell. Shockingly, this was not the only time that Jack Warner and his pals inserted an imposter in the place of Dr Kyss. Two years after Vincy Jalal had taken his place, a similar incident occurred. 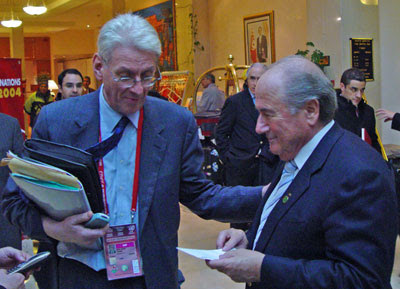 At the 1998 Congress, Dr Kyss tried to fly to Paris to take part in the vote to elect the President of FIFA. 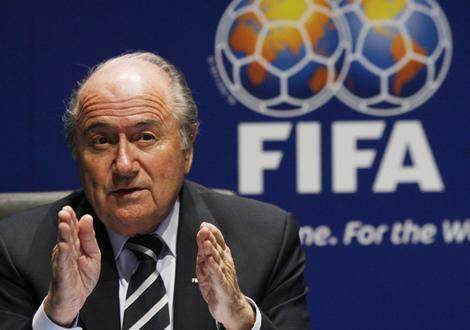 The two candidates were former General Secretary, Sepp Blatter, and Lennart Johansson. However, Dr Kyss was unpopular with the Haitian government, having stood up against them to protect football in the country. As he arrived at the airport to fly to Paris, representatives from the Secretary of Sport in Haiti appeared informing him that he was banned from leaving the country. He contacted CONCACAF President, Jack Warner, and explained that he would not be there. He explained that he wanted Haiti’s empty seat at the Congress to symbolise the interference of the government in sport in Haiti. The 1998 Presidential elections between Blatter and Johansson were expected to be very close. Each representative voted one-by-one, all the way down to country number 191, Zimbabwe, represented by Leo Mugabe. Therefore, with Haiti’s absence, there should be a total of 190 votes to be counted. When the first round results were announced, Sepp Blatter had beaten Lennart Johansson by 111 votes to 80. A total of 191 votes were cast. So what happened to the empty seat that was meant to be left for Haiti? When Haiti’s name had been called out in the roll call, a response of a ‘present’ was heard in unmistakably Caribbean-accented English. No matter that they speak French in Haiti, not English. So who was taking the place of Dr Kyss? The man was Neville Ferguson, a personal assistant to Jack Warner and General Secretary of the Caribbean Football Union. Again, not a single Caribbean delegate raised any comment about how the white, greying, spectacle-wearing Dr Kyss had seemingly morphed into a black man for the conference. Dr Kyss did not find out that his empty seat protest had not occurred until 2002 – four years later. He was shocked to find out what had really happened, and through Lennart Johansson, requested FIFA set up an enquiry to look into what happened. In February 2003, Sepp Blatter announced that there would indeed be an enquiry into the events. It was finally revealed in 2005 that there had been a secret hearing way back in June 2003 that FIFA had tried to keep secret. It found that Neville Ferguson received only a reprimand and would have to share in covering the costs of the proceedings with FIFA. It begs the question, if Ferguson was guilty as FIFA supposedly found, why should FIFA help cover the costs of the inquiry? Quite which of these parts Dr Kyss supposedly breached when he was illegally prevented from leaving Haiti by a corrupt government is questionable. However, if he had still been in his position as Haiti’s delegate at the time of the inquiry, FIFA would have imposed punishments on him. So, how have the men who appear to have been involved in the vote rigging scandal fared since the true version of events were made public? Neville Ferguson continued as an official of various football organisations in the Caribbean under the control of Jack Warner, as well as earning fees as an international match commissioner. 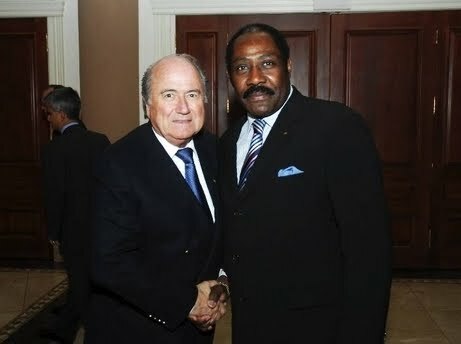 Captain Horace Burrell was awarded the FIFA Order of Merit in 2000, in 2002 he was made a member of the disciplinary commission overseeing the 2002 World Cup, and in 2004 he was given a role travelling the world giving advice to various football officials. And Jack Warner remains one of the most powerful men in FIFA in his role as CONCACAF President and vice-president of the executive committee. However, we shall see more of Warner in the upcoming parts of this collection of articles.